For the past 15 years, The Chicago Lesson Study Alliance has hosted a Lesson Study Conference in early May. The conference offers educators the opportunity to observe two public lessons, participate in panel discussions, evaluate the data collected, and listen to and reflect on the final comments provided by Dr. Tad Watanabe of Kennesaw State University and Dr. Akihiko Takahashi, of DePaul University. 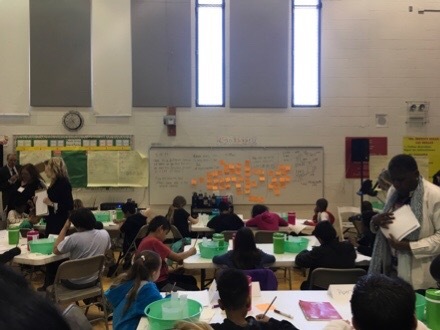 On Thursday, 120 educators spent part of their morning at the Dr. Jorge Preito Math and Science Academy watching the learning of a class of fifth graders evolve. The planning team from the Helen C. Peirce School of International Studies created a research lesson entitled Measuring and Expressing Capactiy with Liters and Milliliters. The lesson focused on students’ understanding of how to choose an appropriate measurement tool when working in different measurement contexts, determining when larger/smaller measurement units are appropriate to use when expressing values for measurement, and understanding the proportional relationships between units and working within conversion systems using proportional reasoning. The lesson was taught by Lori Zaimi, the principal of the Helen C. Peirce School of International Studies. 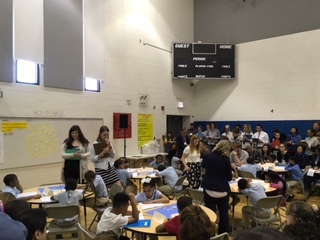 On Friday morning, a group of second graders from O’Keefe Elementary School joined the conference participants at the Dr. Jorge Preito Math and Science Academy. The planning team designed a research lesson entitled How can we organize this information? The lesson focused on exploring how students might visually represent data they collected as a class. It afforded us the opportunity to investigate how students organize information with a bar graph, understand how a bar graph represents data, understand that bar graphs help find information quickly, and answer questions about the data. The lesson was taught by Meghan Smith, the classroom teacher. Thank you to the students, staff, and faculty of the Helen C. Peirce School of International Studies, the O’Keefe Elementary School, and the Dr. Jorge Preito Math and Science Academy for so generously sharing your work so 120 educators could listen, observe, discuss, ponder, and reflect on what it means to learn. Because of #MTBoS, I met @AlexOverwijk at Twitter Math Camp in Jenks, OK in July 2014. One afternoon, Alex, @gwaddellnvhs, and I spent time talking about Lesson Study. Because of #MTBoS, I am on my way to Ottawa, Ontario to spend the next two days participating in a Lesson Study at Glebe Collegiate Institute; otherwise known as Alex’s school. Lesson Study offers educators an incredible opportunity to learn from and with other educators. The collaboration, the conversation about the important work we do, the opportunity to explore ideas and try stuff out and see what happens, and to examine how all of the layers, pieces, and components of instruction move students’ learning during a lesson is something more of us should have the chance to do.